You may have noticed over the last few weeks that TechCrunch links on Twitter have had a nifty custom URL, with links looking like tcrn.ch/1A’ instead of more generic codes from TinyURL or Bit.ly. This was due in no small part to the handiwork of our crack team of developers, but it was made possible by a new service launching today called Awe.sm. There are countless URL shortening services available on the web, and they’re probably only going to become even more popular as Twitter continues to catch on with mainstream audiences. But these services come with downsides, like obscuring where a link is pointing to (which makes them a godsend for spammers). Awe.sm is looking to offer publishers an alternative to these generic services, while also offering a powerful analytics engine that offers much more insight as to how their content gets distributed across the web. Every time we publish a post on TechCrunch, Awe.sm generates a handful of links specific to the service it originates on. For example, the shortcode link at the bottom of this post is different from the link that we send out on Twitter through the TechCrunch account. Awe.sm then tracks these links, analyzing how they’re spread and storing meta data on each. Even better, the links awe.sm creates are compatible with Google Analytics, so you don’t have to learn how to navigate yet another dashboard. This means that we can get a feel for how our links are spreading throughout each service, quantifying just how effective each one is and adjusting accordingly. And for some services, including Twitterfeed, AddtoAny, and TweetFace, Awe.sm can work in tandem with the service to gather even more data. Readers benefit too – spammers don’t have access to tcrn.ch, so all URLs pointing to that domain can be considered trustworthy. 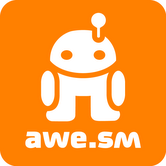 Awe.sm is available beginning today for $99/year, which includes 10,000 URL creations per month (more than most people will ever need) and the option to export your data at any time if you want to stop using Awe.sm. The company’s flagship product is this custom URL shortening service, but it is also going to provide publishers with more tools that will help distribute content across a variety of services to maximize their audiences. The service is also slowly opening up an API to developers, who can build their own applications off the platform.